It's time once again for Wedding Wednesday! This week, Rebecca of Tastefully Entertaining and I selected a preppy blue and green invitation that is just perfect for a couples shower. The fanciful design on this Boatman Geller card is reminiscent of one of the first heralds of spring - the Hydrangea. I used the colors and design on the card to inspire some of my selections. 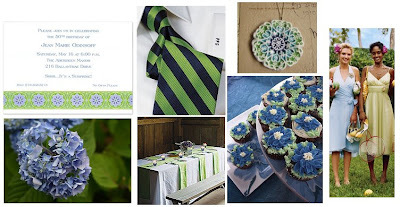 I started off with a preppy blue and green striped tie for the groom-to-be - a perfect way to pull in some of the colors of the design. For adornment, this handmade porcelain necklace from Sofia Masri is the perfect compliment to the design of the invitation. For the bride-to-be, soft blues and greens like these designs from Brides are perfect for a spring or summer affair. For a more dramatic look, consider deeper hues. Is it bizarre that a grown woman adores cupcakes so? These lovely floral cupcakes are a fabulous dessert sure to delight guests. 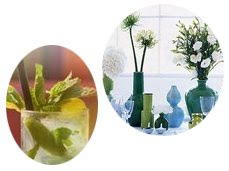 For your tabletop, go for a simple white cloth with touches of celery greens and soft blues. Of course, Hydrangea, as photographed here by grendelkhan, make the perfect tabletop adornment! Rebecca's inspiration board is cool and refreshing - as always! Be sure to check out her post for some fabulous inspiration.